Last Saturday in Norwich a demonstration gathered in Chapelfield Gardens and made its way cheerfully and noisily towards City Hall. 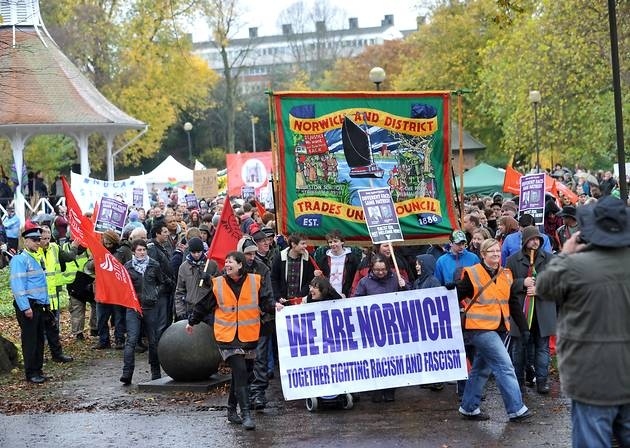 This was We are Norwich, a coalition of trade unions, community and political groups, protesting against the English Defence League, who were marching for the first time in the city. As the two marches converged they were separated by barriers in front of the steps. On one side the gloomy fascist contingent in dark coats and a sound system blaring harsh anthems. On the other the colourful counter-demonstration with rainbow-coloured faces, banners and laughter. Outside the War Memorial the two groups, faced each other and jeered, like two stags with invisible antlers, unable to lock horns. Only a couple of streets away there was, however, a different story. 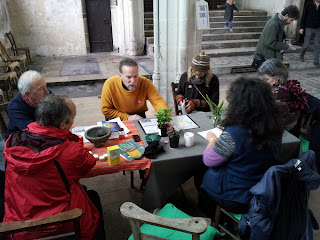 "What we need is not confrontation, but to be able to work together," said someone at the Long Table in the aisle of St Lawrence's Church. 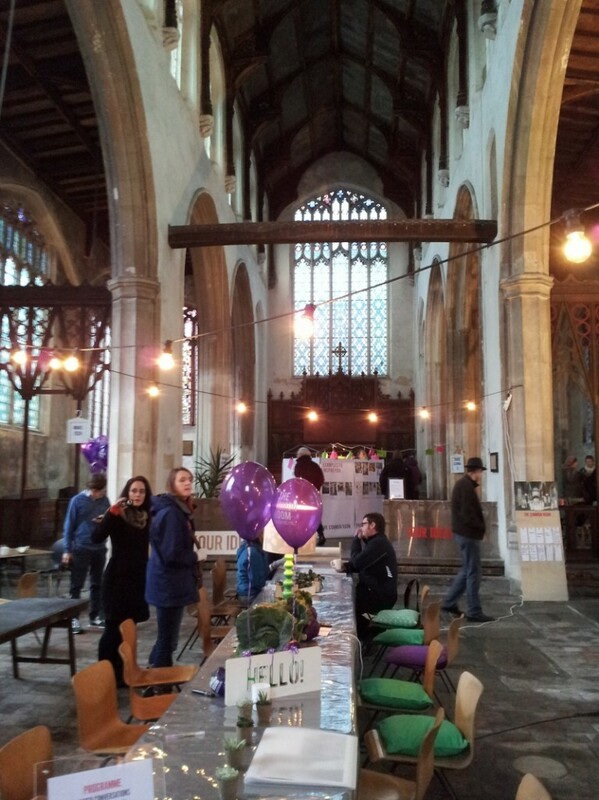 This was The Common Room, a prototype day organised by Social Spaces and 00:/ in collaboration with the Churches Conservation Trust. It's a social enterprise that helps communities in different UK cities make and shape a shared space in which to meet, learn skills, barter knowledge, run on the principles of co-operation, connection and resourcefulness. Great ideas, projects and enterprises seldom originate from a single person working in isolation. For stimulation, enthusiasm and collaboration, people need to work in an environment full of fellow entrepreneurs, ideas, learning, conversation. On Saturday you could share your ideas for what you might do if you were a member of The Common Room Co-operative, take part in a Trade School class by exchanging food, items or advice for new knowledge - from herbs for resilience to time skills to social media - host a conversation, or drop in to bake bread or build a web app. The EDP covered the first story, but the second went unreported. Clashes between people are news, people getting on and creating a friendly future are not. As a result the world we read about and perceive all about us is skewed by an often hostile political paradigm. So this is a story about The Story that is Not Being Told. 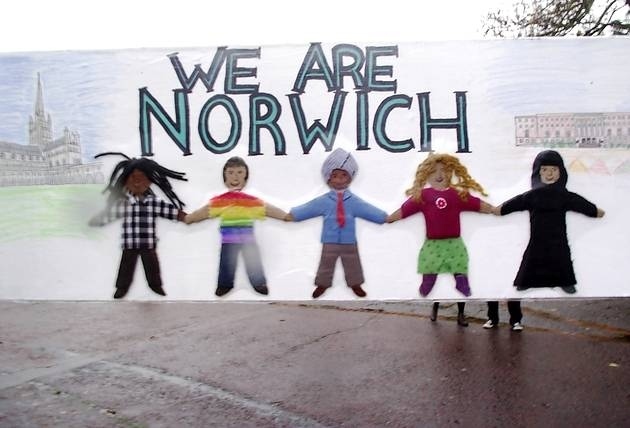 Since joining the OneWorldColumn in 2009 many of the stories I have been reporting on have stemmed from the Transition movement which I have been active in for the past five years, both with local initiatives, Transition Norwich and Sustainable Bungay, and as part of a national network. This spring several of us decided to launch a national quarterly newspaper to gather these stories in one place and distribute them throughout the UK. When I joined OWC it was a weekly column on the EDP. It became a blog in 2011, when the column was cancelled after six years. Although on line communications and social networking form a strong messaging system, the physical printed page still commands greater attention. Print goes places that computers do not go and has the great advantage of putting a complex narrative in one place, directly into your hands, which one-page-at-a-time virtual media cannot replace. Mainstream papers, severely hit by the recession and loss of advertising revenue, are shrinking their staff and increasingly publishing stories from “the wire” and press releases, rather than real-time investigation. Stories are judged not by their merit, but by on-line readership figures. As a result the mainstream press often sinks to the lowest common denominator and defaults to the governmental, or corporate, line. The smaller and more progressive stories disappear altogether. Celebrities and violence prevail and “reality” becomes defined within these very constricted parameters. Increasingly too many people now consider communications to be something they can get for free. So though this is probably the most challenging time to be launching a new national newspaper, it will not lack for stories, nor will it lack for a readership keen to hear the good news from places the mainstream media does not go. My first column on OWC was about Leaving the Pleasuredome and preparing for a low-carbon future, shifting away from the dominant narrative, to what Charles Eisenstein calls " a new story of Self and a new story of The People." The Transition Free Press is based on this premise. After publishing our preview issue in the summer, the need for new media now seems more relevant than ever. As peak oil pushes unconventional oil and gas extraction to new extremes, as climate change brings storms and food crises in its wake, as the economic recession brings many countries to their knees, so our desire increases for alternative solutions and a kinder, more generous culture that can look the future in the eye. 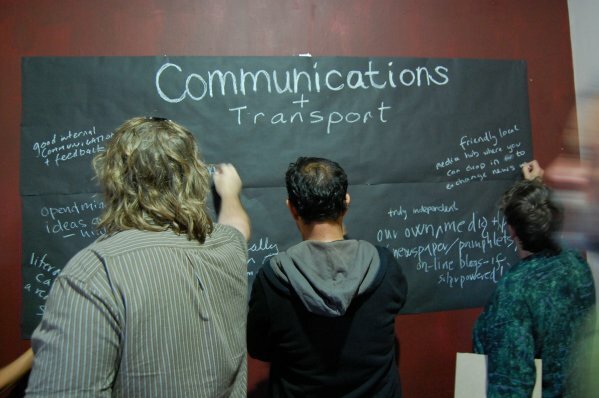 Our small, resilient paper will champion communities and projects that often get missed by mainstream media. We’ll be holding up a beacon in the potentially dark and difficult times ahead. Where the breaking story is of confusion and greed, we aim to bring coherence and the gift economy into play, where there is fantasy we will bring grassroots reality, where there is loss we will show the opportunity for well being and knowledge share. And most of all where there is silence, we aim to bring words and listen to the voices of people who do not normally get heard. We’re planning to run four issues during 2013, starting on Feb 1 2012. Our 24-page issue will follow the blueprint of our preview issue and contain a colourful mix of news, reviews and features, dedicated pages to energy, the land, people, economy, food, well-being, the arts, cartoons and a unique Transition agony column. In these four pilot editions in 2013 we hope to bring together in one place the stories that help us navigate the times of downshift, stories about people by the people who are coming together in their neighbourhoods and initiatives, starting up food projects, alternative energy schemes, and thinking within a broader, deeper and more meaningful frame. To show, as Mark Boyle said recently: “Different ways of being human” other than the self-obsessed consumer model we see promoted everywhere else. This week sees the launch of our first Transition crowd-funding appeal with BuzzBnk , an on-line crowd-funding platform that brings social enterprises “looking for start-up or growth capital together with like-minded people keen to participate in a new way of funding social change”. So now in this 90-day campaign we hope to raise the funds to enable us to send out the good news throughout the UK (as well as on-line everywhere else). You can buy an annual subscription for £15 or give a higher contribution (£50-£750) and receive gifts, from an ecologically-sound T-shirt to a whole Transition library. 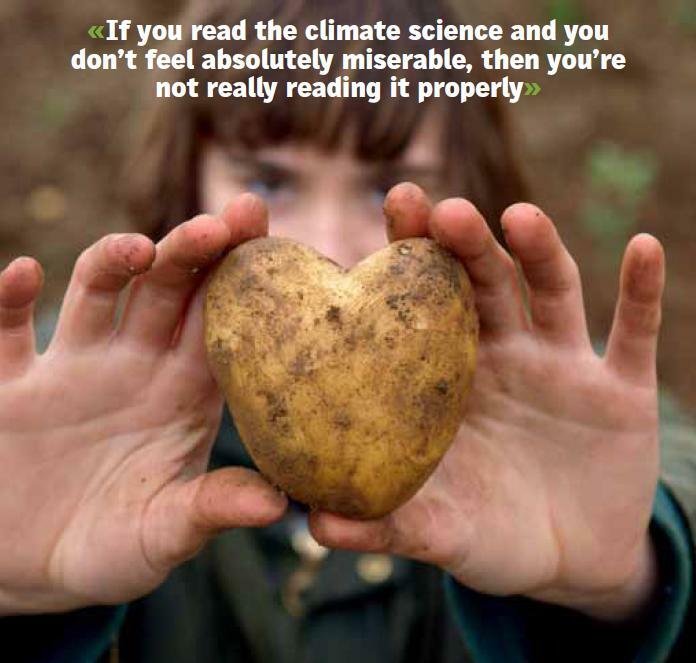 Can you help by buying a subscription, giving a donation, or joining our distribution network? Could you spread the word, through blogs or social media or word of mouth? Funding a newspaper is a big challenge, but we are determined that the word will get out there, on city streets, neighbourhoods and social spaces everywhere. Our 2013 pilot editions will include local stories and projects, including the Magdalen Street Celebration and Norwich FarmShare. The first issue will be published on 1 February 2013. Follow us on Twitter transfreepress and Facebook.You can buy an individual subscription, or make a contribution to the enterprise on our crowd-funding page here.